For those people who don’t know what a wether goat is, it’s a male goat, also known as a buck or a buckling, that has been castrated, or more specifically, had it’s testicles removed. The process is also known as neutering. This is a common practice for breeders who have fulfilled their buckling goat’s breeding potential. If the buck is done breeding, and it isn’t going to be slaughtered for meat, then it’s best to castrate the goat. Why might you ask? What are the benefits of castration? First, only the highest quality bucks should be bred. This ensures that you’re only getting a premium offspring. As buckling goats grow older, their breeding qualities begin to diminish. 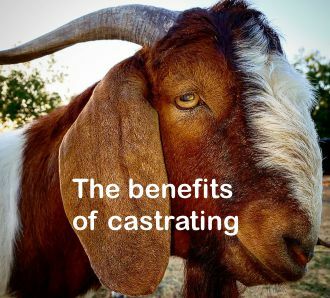 By castrating a buckling that’s done breeding, you won’t have to worry about it getting any of the female goats, also known as does, pregnant and producing a poor offspring. Second, bucklings that have not been castrated are required to have their own living space. The reason being is because bucklings tend to be a little aggressive and can pose a threat not only to children but also the other goats as well. This is especially true during breeding season. By castrating a buckling, you’ll get rid of the aggressive behavior. This in return will allow you to save space by letting the wether goats roam with the other goats. Third, during breeding season, bucklings tend to urinate all over themselves and even have scent glands that put out an aroma which attracts does. The problems is, most people find this scent to be very unpleasant and hard to live with. On a windy day, the odor can even travel long distances and potentially annoy your neighbors. Sometimes goat breeders will castrate their bucklings and sell them to farmers and individuals with lots of land. Why would anyone want a wether goat? Well, there are many advantages to owning these wether goats. For starters, they make good pets. Like mentioned above, bucklings can be quite aggressive during breeding season making them dangerous around kids and other goats. However, when you castrate a buckling, they become very playful, fun pets to own. In fact, they’re even great with children. Another benefit of owning a wether goat is their ability to clear unwanted vegetation. This includes weeds, grass, bushes, twigs, and other plant like. Not only will they remove all your unwanted vegetation, they can also consume several square feet of plant life in a very short period. Hate to mow your lawn? Invest in a few wether goats. In addition to these two benefits, wether goats are also great for individuals who participate in outreach programs. This can include things like petting zoos for kids, agriculture and livestock demonstrations, community parades, and so on. The last thing you want to do is use a pregnant female goat. Taking her off the farm can put too much stress on her. A forth benefit that’s really worth mentioning is a wether goat’s ability to translate special information to the breeder. A wether goat will let the breeder know when a doe is in heat and wether the breeding process was a success or not. Once the breeding process has been complete, the wether goat will also let the breeder know if and when they can reintroduce the doe back into the herd. This is a very useful tool that comes in quite handy, especially for breeders with hundreds of goats. Lastly, wether goats can be trained to lead your herd of goats out to the pasture to graze and then back to the farm near the end of the day. Wether goats have even been known to stop fights between two or more does. They are considered by some as the peace keepers of the farm. Now, how cool is that? Castrating or neutering your buckling is a pretty easy process. In fact, if you give the buckling the right painkillers, the neutered goat will be back to grazing in the field within just a couple hours. As long as the procedure is completed right, and the tools being used are sterilized, there is very little likelihood of an infection. The hardest part of the whole process is choosing which bucklings you will breed and which ones you will castrate. 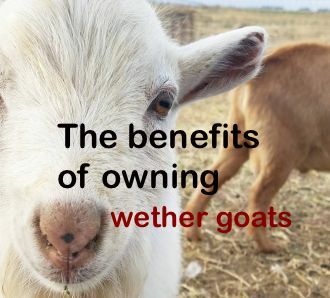 Now that you know what a wether goat is and their purpose, you can use them to your advantage or simply keep them around as lovable, cuddly pets. They really are a valuable resource. 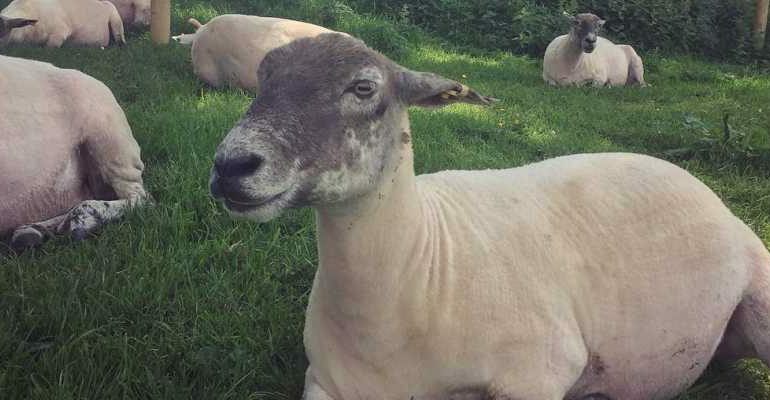 How Many Sheep per Acre Should You Have on Your Property?